In reference to the date on the calendar — not the temperature on the thermometer — it seems fall is in full swing. But here in the Midwest the season hasn’t quite taken off. The leaves are changing and the days are getting shorter (no trace of sunlight at 5 pm? What is this?! ), but our sunny 70-degree weather is deceiving. It’s like November showed up to the party without being invited (do you even go here?). Or maybe it’s the calm before the storm. Regardless, it’s fall whether it feels like it or not. So in celebration of the changing season, or rather loss of summer produce, I’m sharing this fall recipe for Charred Cauliflower Steaks with Romesco Sauce. It’s great as an appetizer or side dish. This Romesco sauce — perfect on almost anything — is simple and incredibly easy to make. Just a few pantry ingredients are all that stand between you and a tasty weeknight dinner or appetizer. 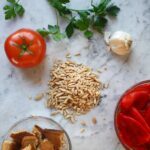 Roasted red peppers, toasted almonds, garlic, and parsley are the main ingredients that whip up into this gorgeous sauce. Then slice a few heads of cauliflower into thick steaks and sear in a piping hot cast iron for the ultimate presentation. Pulse bread, almonds, and garlic in a food processor until finely ground. Add red peppers, tomato, parsley, vinegar, and red pepper flakes. Purée until smooth; season with salt and black pepper. Trim leaves from cauliflower heads. Place heads steam side down and cut, top to bottom, into 1-inch thick slices, or “steaks”. Place steaks on a sheet pan, brush both sides with oil, and season with salt and pepper. Heat a large cast iron skillet over medium-high for 5 minutes. Add 2–3 steaks, place an additional cast iron skillet, or weighted pan, on top of steaks, and cook until charred, about 2–3 minutes. Flip steaks and cook another 2–3 minutes until charred. Transfer to a serving platter and repeat with remaining steaks. Garnish with parsley and serve with Romesco Sauce.